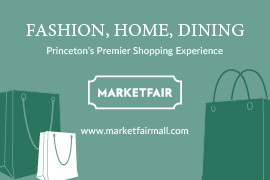 Shopping in Princeton and the surrounding area has never been better. There is something for everyone - upscale chains, as well as unique shops and boutiques. POL Shopping Guide provides the latest information on what's new and happening with our local merchants and what boutiques are worth popping into as you stroll the streets. Make this holiday season a brilliant one with a gift from Hamilton Jewelers. We have something for everyone on your list. Let our gift experts help you find the perfect expression of holiday cheer. We have beautiful hostess gifts to be sure you make a great entrance and many holiday décor items to dress your festive gathering. From precious gems and diamond jewelry to stunning timepieces, your gift list covered. For over 100 years, Hamilton has been helping clients celebrate this glittering time of year. 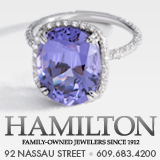 Visit us at 92 Nassau Street or shop online conveniently at www.hamiltonjewelers.com. All purchases include complimentary gift wrapping and shipping. Wishing you a warm and wonderful holiday season. 1-800-5-HAMILTON. The Catered Cuisine professionals at Pennington Quality Market make entertaining simple and fun, no matter what your budget. From the smallest gathering to the most extravagant wedding plans, we have the experience and know-how to cater every affair with elegance and style. Our catering coordinators assist you every step of the way, from choosing the perfect menu selections to those all-important presentation issues. Our Catered Cuisine chefs work their culinary magic on everything from appetizers to main entrees to desserts. If we don’t offer a menu item you desire, our chefs can prepare that special request. When the special day arrives, you’ll welcome guests and enjoy their company while our catering professionals smoothly set up, expertly prepare the offerings, serve, and quickly clean up when the festivities are done. It’s that easy. Learn more at www.pqmonline.com. Pennington Quality Market…Your Market. Your Way. Every Day. Sourland Cycles is a different kind of bike shop. It's a shop where the commitment to women riders is refreshingly unique. Where brands are different - GIANT, BMC, Linus, Pedego Electric bikes with custom designed road bikes and tandem bikes are offered through Independent Fabrication and Tandems East. Where quality bikes for kids start at $185, and for adults at $350. Where our bike fitter, Kerri Croland, is on hand to help you get more from your cycling. Where classes are offered on how to ride, where to ride, maintenance, and yoga. Where service is exceptional - our head mechanic, Tom Cooper, is pro race-certified, yet practical tool guy. Sourland Cycles services all models and guarantees every bike we repair and will not accept payment if you are not satisfied with a repair, tune-up or adjustment. Pickup and delivery service from your home or workplace. We are one of the top-ranked independent record stores in the U.S.A. and stock over 100,000 new and used LPs, CDs, and DVDs. With more than 35 years’ experience buying and selling, we can help turn your music and movies into cash today! Stop in to speak with our friendly, knowledgeable staff, or call us at 609-921-0881. We can also be found on the world-wide web at www.prex.com. Smith's Ace Hardware is your first stop for everything from hardware to bird seed. It is a 3rd generation family-run business located next to the library in the Princeton Shopping Center that offers every shopper quality, variety, and service not found in the "big box" stores. Smith's stocks electrical, plumbing, paints, kitchen wares, lawn & garden, as well as seasonal items such as Weber Gas Grills and swimming pool supplies.